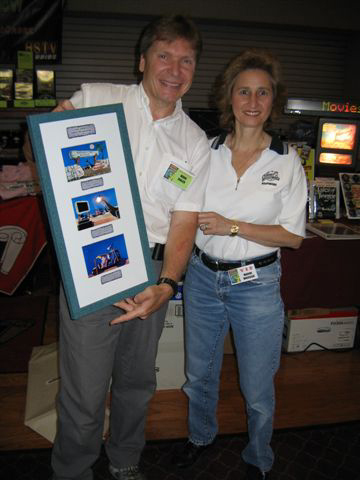 Photos provided by Barb Heiss, Kevin Slick, Phil Smoot, Geoffrey Curtis, Juan Ortiz, Brian Nichols, Steve & Maxine Wrzesien and others - thank you! 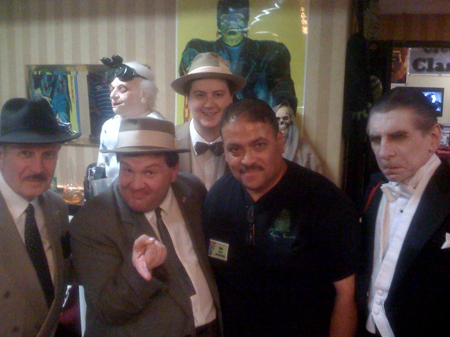 Juan from Florida joins the boys - Bud (Bill Riley), Lou (Joe Zeigler), Drac (Michael Thomas) and Scoop Fields (Jason) . 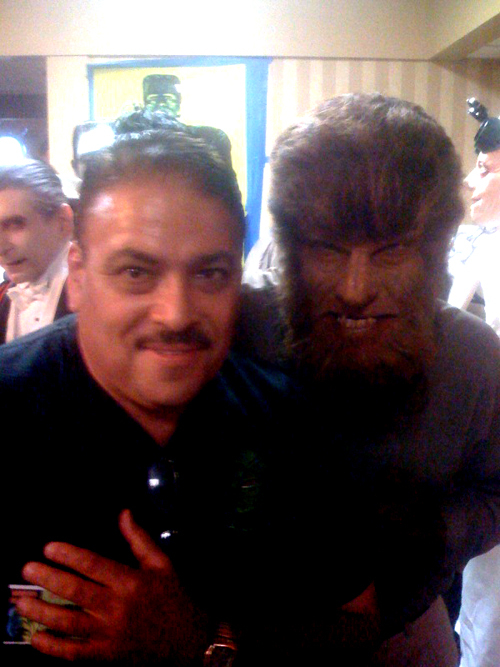 Juan and Ron Chaney as The Wolf Man (make-up by Ron Chamberlain). Juan with Ron Chaney and the next Chaney Generation Jaklyn and Jennifer! 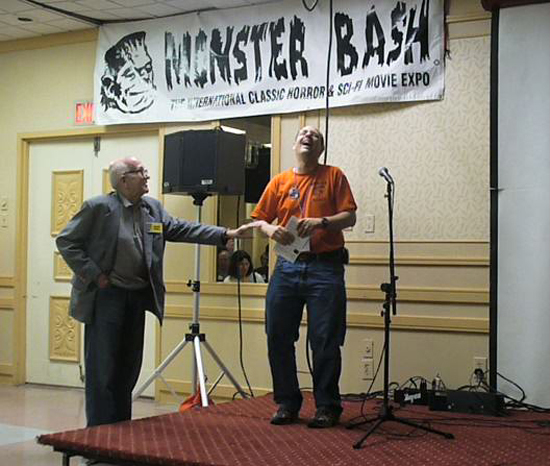 In a live "New Product" presentation at the Monster Bash, Dermatologist Ron Chamberlain (right) does a "Before/After" demonstration for his new skin care product line. For those who have not previously experienced such an event, please note that the Before is on the left. 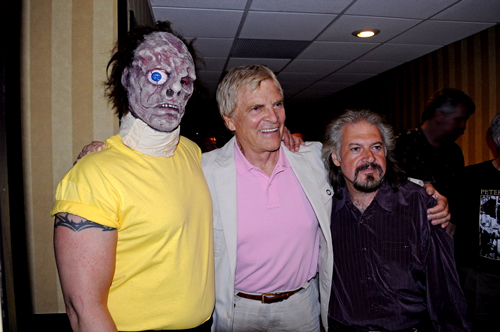 Michael S. as the Teenage Frankenstein, Gary Conway and Ron Chamberlain who designed the mask. Dalton Smoot (left) and Danny Nemati (right) pose as David "The Rock" Nelson (center, as if anyone who has attended a Bash does not know) continues his seemingly eternal quest to produce(? ), well, something . 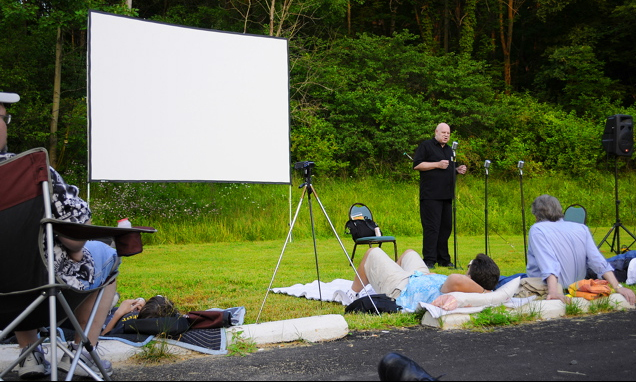 . .
Don Reese does stand-up comedy prior to the outdoor screenings! Ron Adams, Son of Ghoul, Cliff Curtis and Geoffrey Curtis getting ready to rock Saturday night. Rapid fire free cake for attendees. Donnie Dunagan, being the Marine he is, right in their on the front line of cake serving for 1000.
alling Don Reese's "horror film warning" that one should "never drink anything from a beaker," Dalton Smoot (center) chokes for a moment as he realizes that he has just been served a piece of cake from the Grandson of Frankenstein! 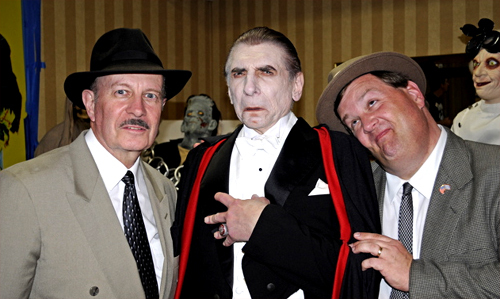 Bill Riley as Bud Abbott, Michael Thomas as Count Dracula and Joe Zeigler as Lou Costello at Monster Bash 2009. I scream, you scream, we all scream for Franken-stein! 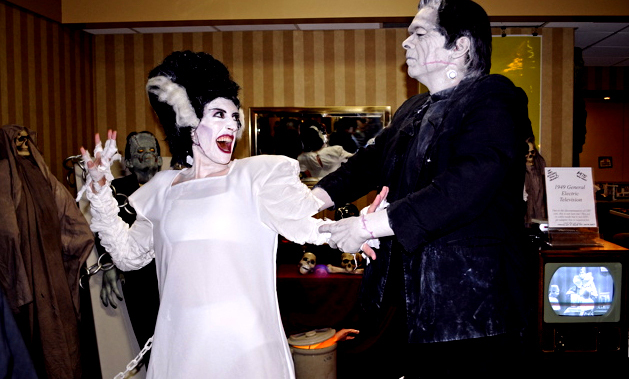 Amanda Frankenstein (really) as The Bride and Joe DeMuro as The Monster in Ron Chamberlain make-up. 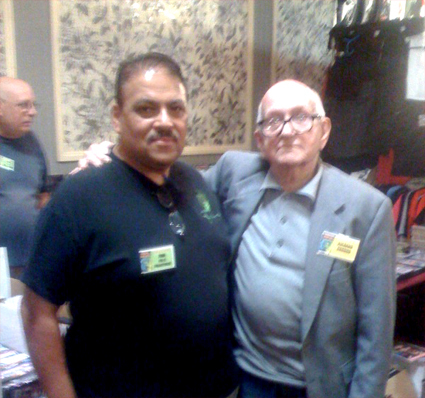 Juan with Richard Gordon (FIEND WITHOUT A FACE producer). 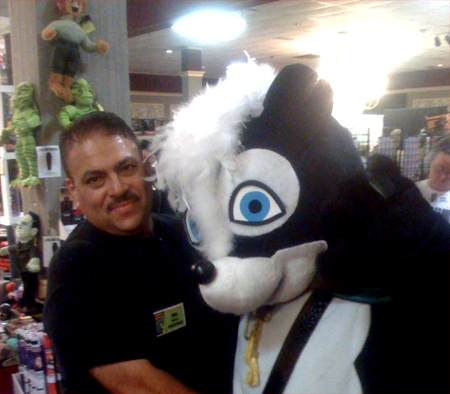 Juan and Stinky the Skunk (from LITTLE RED RIDING HOOD MEETS THE MONSTERS). Stinky tagged along with Daniel Griffith from Ballyhoo Productions. 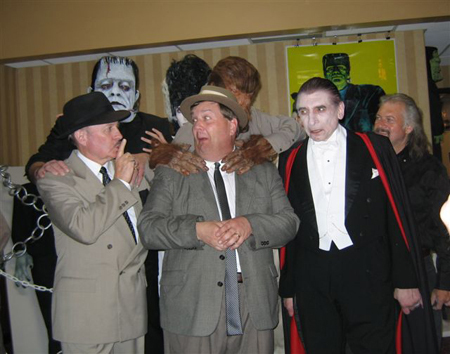 Abbott & Costello Meet the Monsters. 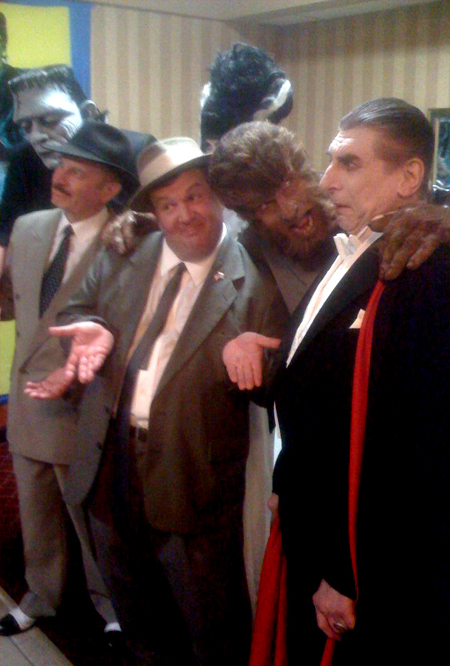 Daniel Horne in his own mask design as Frankenstein's Monster, Bill Riley as Bud Abbott, Joe Zeigler as Lou Costello, Ron Chaney as The Wolf Man (make-up by Ron Chamberlain) and Michael Thomas as Dracula. Richard Gordon cracks Ron up! A picture, is indeed, worth a thousand words. Mark Bialak of the Drive-In Movie Club and Maxine Wrzesien . Teenage Frankenstein and Maxine at Bash! 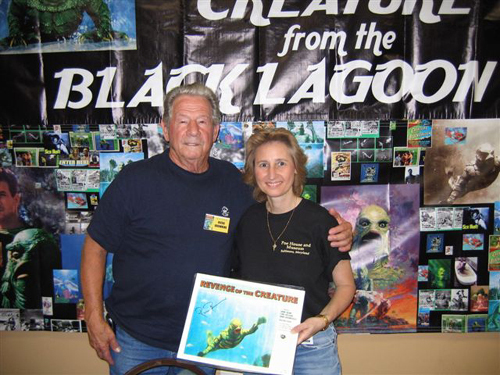 Ricou Browning, the underwater CREATURE FROM THE BLACK LAGOON with Maxine. 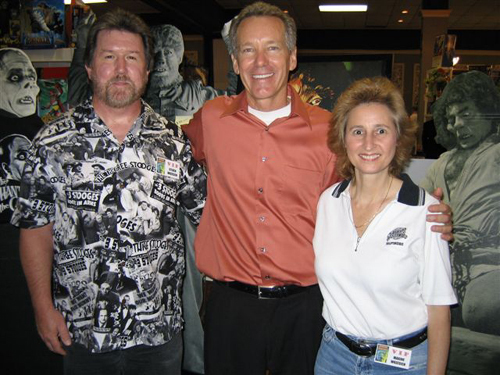 Ron Chaney in the center with Steve and Maxine...all doing the Monster Bash!